When you misplace a million dollars of your company’s money, you go to jail. When you misplace a hundred billion, you go to another planet! When 22nd century desk jockey Jamie Sturm loses a fortune for his interstellar trading company, he’s forced to cross the galaxy risking his neck — and an interstellar war — to get it back! That’s Overdraft: The Orion Offensive — the first long-form science fiction story set in a new universe of my own making. And you can tag along on Jamie’s misadventures every two weeks in the prose serial launching April 2 from Amazon Publishing’s science fiction, fantasy, and horror imprint, 47North! The first 12,000-word, multi-chapter episode releases then — and then new episodes continue every two weeks after that as a Kindle Serial. For a single payment of $1.99, you receive the entire series, from first episode to last, downloaded to your device as the episodes go live. You can join in at that price any time while the serial’s going; the previous episodes will be downloaded immediately. There are eight episodes, comprising a complete novel-length story, which will be completed by this summer; a trade paperback and e-book collection follows at that point, at regular book pricing. Serialization is something I know a lot about, and I’m excited for the opportunity to tell a prose story in this way. A lot of the classic science fiction stories I loved as a kid appeared first not as novels, but as serials in pulp magazines decades earlier. In large measure, comic books have carried on the serial tradition: from Star Wars: Knights of the Old Republic to Mass Effect, all of my 20 or so graphic novels began as monthly comics. 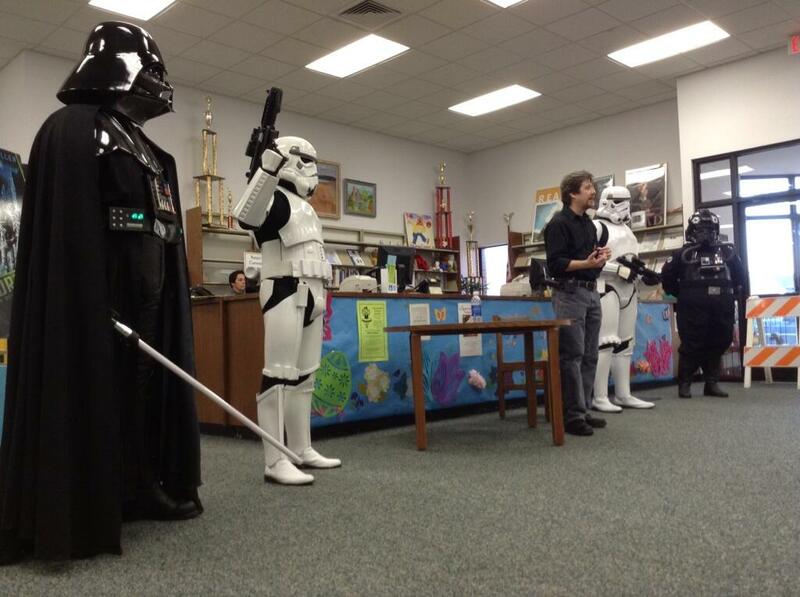 It’s an interesting way to tell a story — and particularly after the success of Star Wars: Lost Tribe of the Sith, I was looking for a way to do something similar myself. And having spent most of my career in licensed fiction, readers have been asking to see something set in one of my own worlds. So as you might expect, Overdraft: The Orion Offensive (or, as we call it around my house, “OOO!”) has a lot of the elements that I really enjoy writing. In Overdraft, conniving desk-trader Jamie has blown through a huge amount of his corporation’s money, putting the whole expedition at risk. But the cowardly swindler is surprised when the armored security team arrives to take him back to the stars to get their money back, one dangerous alien encounter at a time! It’s space-trading space opera with a military SF bent, set in the 22nd century universe I introduced in “Human Error” in last year’s Armored anthology from Baen Books. There’s no instantaneous communication in the “Whirliverse,” so commerce is very much more like it was during the time of the East India Company, which was my inspiration. And there’s a size limit to interstellar transportation, which literally changes the shape of once-familiar starships: everything's modular. It’s stellar travel in the Age of Rail! The folks I’ve run the story past are pretty excited — and I am, too. I’m working with 47North Editor David Pomerico, who I worked with on Star Wars: Knight Errant and Star Wars: Lost Tribe of the Sith when he was at Random House. 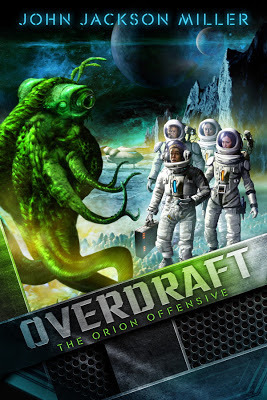 And the cover for Overdraft: The Orion Offensive is by Paul Youll, known for his wonderful covers for Star Wars: Scoundrels and Star Wars: The Essential Reader’s Companion. I’m delighted to have the opportunity with 47North to explore space — and the serial space — at once! There’ll be more details to come — and as this is one of my own projects, I’ll be able to provide some more related content here on the site as time goes on. A page has been started for the project here. Be sure to check out the other Kindle Serials — and follow me on Twitter at @jjmfaraway to be alerted to more news! 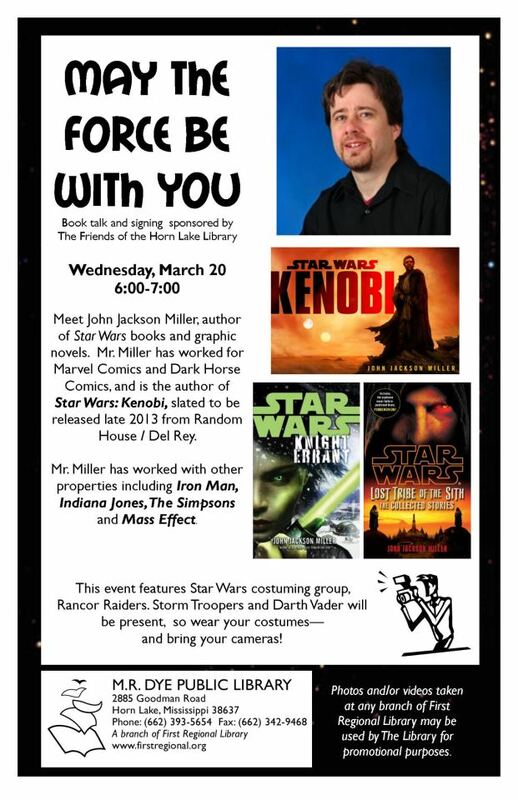 In advance of my appearance at Midsouthcon — my panel schedule will appear here in a couple of days — I'm doing an event Wednesday at the library in Horn Lake, Mississippi, at 6 p.m. The library is at 2885 Goodman Road. Here's the flier the library produced, and their Facebook link. See you there!